Taking a walk last week, I stumbled upon a free library in my neighborhood. I’ve noticed these popping up all over the place, and I think they’re really fun, even if they court some controversy. But I’ve never used a free library. And…I realized I hadn’t read 95% of the books on the shelves of this one. I hadn’t even HEARD of most of them. And these are readers in my very own neighborhood. 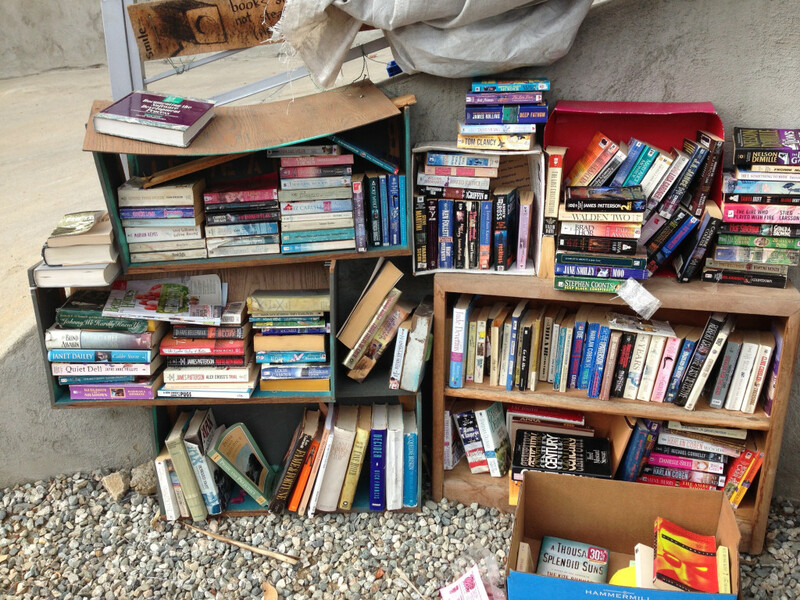 Which begs the question, what kind of books end up in a free library? Do they reflect popular taste? Local taste? The owner’s taste? Are the books there because no one wants to keep them? Or are these the books people want to share the most? I was going to pick one at random to read, but then I had a better idea. I took a photo of the shelves. I brought it up to Julia and Tod, and we’ve decided to open it up to you, our listeners, and make an episode out of it. You decide: what do we read from this free library? We’ve set up this survey with the photo I took, with a list of all the titles and authors I could decipher. There’s a lot of spy novels and romance. There’s an Algebra textbook and a guide to owning Pugs. There’s Jane Austen, and no poetry, and surprisingly, very little nonfiction. The survey list starts in the upper left hand corner and moves clockwise through the shelves. Where the text wasn’t legible to me, I put a “?” Feel free to pick a book based on its cover, its color, its worn spine…be as mean or as kind or as random as you want. We will read whatever book gets the most votes.